The efforts of those of us who call themselves “bike advocates” in Dallas can commonly feel like fruitless labor. We too-often find ourselves on the wrong end of the awards list when it comes to surveys, polls, and quality-of-infrastructure lists anytime we pick up a magazine or click on a Facebook link. It should reasonably surprise no one that so many of our own blog posts shared here assume a tone of frustration and negativity – and deservedly so. But, in the last few hours of 2014, we’d be amiss if we didn’t take a moment to graciously reflect on a few things that our Fair City did manage to get right this year without the usual pall of imminent doom. What began as a conversation between Angela Hunt and Scott Griggs (and later a simple path tamped and mowed into riverbanks by DORBA stalwarts Dave Gray and Paul Hakes) was finally realized in 2014 as a fully paved bike and pedestrian trail tracing both sides of the Trinity inside the levees. It’s the first solid infrastructure we’ve seen in this area of the floodway that’s slated for some ambitious park development, and it couldn’t have arrived soon enough. The trail connects Crow Park at the new Sylvan bridge in the Design District down to the Santa Fe Trestle bridge, where you can cross the river and follow it most all the way back up to the new Continental Bridge park. Although the Skyline Trail has technically not fully opened, it already sees daily use as both a recreational and commuter connector to cross the Trinity away from motor vehicle traffic. In what may be the most pleasantly surprising action by city council, a 1996 ordinance requiring cyclists to wear helmets on city streets was eased to allow those over 17 years of age to ride neighborhood streets without fear of citation. Dallas’ ordinance, now in line with most major metro cities in the US, figures to ease the barrier to entry for the maybe-forthcoming city wide bike sharing programs akin to what we see in Fort Worth, Austin, San Antonio, and Houston. While BFOC still encourages helmet use, the ordinance went largely unenforced in most areas of the city, according to citation data, so council saw fit to do the right thing. If the post-ordinance pattern of ridership data from other major US cities holds true for Dallas, we can expect this to have a positive impact on our own numbers here at home. We’re all for the choice of personal responsibility, and hey, we’re confident we can find something else to chat about with Officer Gordon. With the abrupt departure of Max Kallhammer not too long after the Dallas Bike plan was passed, speculation went wild about who would be chained to the post that was seemingly unfit for any bright-eyed transit planner bearing ideas that were less than 50 years old. The Dallas Morning News anointed Ashley Haire the new ‘Dallas Bike Czar’ roughly 90 seconds after her hiring, and it wasn’t much later that she and teammate Transportation Planner Jared White were overseeing as much bike-friendly road striping as we’ve seen in a decade. We can only hope since she’s a legit engineer who hails from the bike lane holy-lands of both Austin and Portland, that council can shut up and listen to her advice when it comes to matters of design. Ashley has been closely engaged with the newly formed Dallas Bicycle Coalition since its inception, and, based on her comments, has a solid grasp of the cultural attitudes that North Texas bike commuters face daily that make Dallas all the things that Portland ain’t. Good luck, Ashley. Welcome to Dallas. We’re rooting for you. We must tip our hats to Councilmen Phillip Kingston, Scott Griggs, and Adam Medrano for greasing the wheels leading to the formation of the Dallas Bicycle Coalition. The coalition was later organized as a group of citizens who engage (both to inform and give feedback) with city staff on our behalf every month as Dallas struggles to get the planned projects on the ground. 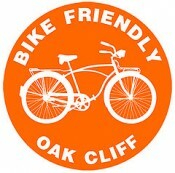 The Dallas Bicycle Coalition is comprised of cyclists from the various neighborhood Bike-Friendly groups that have sprung up around town, and chaired by Oak Cliff’s own Jonathan Braddick. While we wait patiently on the opening of the Oak Cliff Streetcar, the collaboration between DART and the Downtown Dallas Corporation has given commuters the next-best option to get a ride in and out of downtown from Oak Cliff without the car keys when you need it. The recognizable hot-pink bus shuttle requires no fare, runs every 15 minutes, and has brand-spanking-new bike racks mounted to the front of each bus. It might not offer service as early or late (11am – 11:30pm M-Sat) as it should, but bicycles hanging off the front of the ol’ 722 headed to Bishop & Davis are an increasingly common sight. This only leads us to believe the word is clearly out about how easy riding the D-Link with your bike is, or the Bishop Arts valet situation is really as bad as you’ve heard. Hint: It’s probably both. I have mixed feelings about the helmet law repeal. I think that there are some people just too dense to use common sense, and they need to be “reminded” to be safe.